Q. Who am I? Two weeks ago there were 183.8 of me, this week there is 187.3 of me. A. Billions of dollars in gross debt. Is there any way we can get the penny to drop on why this is not healthy for the Australian people? Look at it this way; we had all those demonstrations on Tuesday because of a prospective $400 million loss in medical research funding; in two weeks we dropped almost 9 times that amount. We could have built the Toowoomba Range Crossing twice, or we could have completed the required sections of the inland rail for this amount. We could have put slightly more money, than $1.4 million towards myrtle rust, an introduced direct threat to eucalypts in Australia. Something smells. Ken Henry has left, Julia Gillard is panicking, and our gross debt is tearing through the roof. Seeing as Mr Swan always talks about net debt, maybe he would like to find some of these funds he used in netting off this $187.3 billion and use it now to pay off some of the debt. I will tell you there are two things, he won’t be able to tell us where the money is and secondly, if he did know where it was, he would be terrified of what would happen if he actually used it to pay off the debt. For example, the largest section of the money used in the netting process is for public servants’ superannuation. I have been banging on about this for about two years and I am not going stop till Wayne stops borrowing and starts paying the money back. We have found ourselves in this position because we have got a government that spent like a person who should have been swabbed. We will look back in history and cringe as to how on earth we got ourselves into such strife. $2.5 billion on ceiling insulation, $16.8 billion on school halls and random $900 cheques, for who only knows what purpose followed by a little home cooked policy cake to cool the planet. Australia asks where do these manic ideas come from, and how on earth are you going to repay this debt? The highlight of the election coverage. Wayne ‘Goose’ Swan is torn to shreds by Michael Kroger during Channel Nine’s live election broadcast. As he lays on the mat spitting out his teeth, Barnaby lays the boot in. If only the Coalition had got stuck into Swan like this months earlier. The GFC Is ‘Over’, Ken? The Australian sharemarket lost a massive $95 billion in a five-session horror streak this week, as the European debt crisis and the proposed resources super profits tax severely dented investor confidence. It was the worst run for local equities since the peak of the global financial crisis, and the meltdown appears far from over, as the second phase of the global financial crisis takes hold. The local market tumbled a further 2 per cent yesterday, taking its loss for the week to 6.8 per cent, leaving the benchmark S&P ASX 200 index at its lowest point in 17 months. Yesterday’s sell-off came after an extraordinary lead from Wall Street, where the Dow Jones sent shudders through the world, experiencing its biggest intraday move in history after another drubbing on European markets. Asian markets also tumbled, with Tokyo’s Nikkei falling another 3 per cent, forcing the Bank of Japan to mount its biggest one-day injection of cash since 2008. There was no sign of a let-up in Europe last night, with major markets opening as much as 2 per cent lower. CMC Markets analyst David Taylor said markets were fearful the Greek debt crisis would spread globally and jeopardise growth. “The sheer fact there is a possibility of a second global financial crisis or a second massive credit crunch inspired by a sovereign debt default, markets are . . . terrified about that,” he said. Ken Henry completely and utterly failed to foresee the onrushing first wave of the GFC in 2007-08. His “go early, go hard, go households” economic stimulus advice to Rudd Labor has resulted in massive wasteful spending, rorts, fraud, house fires, deaths, and a Budget thrown into an unprecedentedly huge hole. He preemptively declared that the GFC is ‘over’. And as recently as February, he could not even imagine any further “shocks of the sort that would be globally significant”. How much is this arrogant, demonstrably incompetent clown receiving from MY taxes? 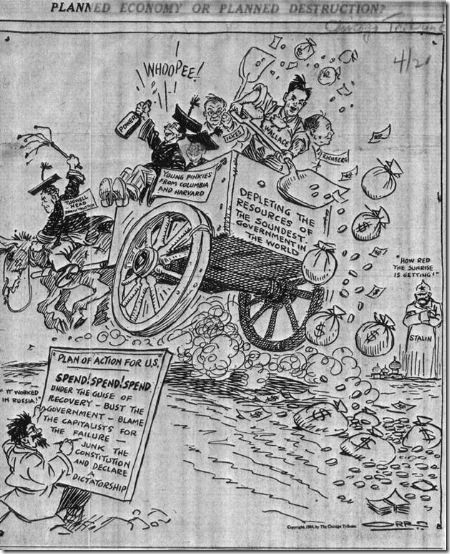 Note carefully the title at top, and the ‘plan of action’ in the lower left corner. Rudd’s borrow-and-spendathon – playing straight from the old Marxist playbook. How much will Rudd’s spending spree cost Australian taxpayers… just in Interest-only? $48.488 Billion to 2013. With more to come. That’s enough to buy a No-business-plan-No-cost/benefit-analysis National Broadband Network. With $5.5 Billion left over in loose change for, let’s say, a disastrous home insulation scheme plus the costs of fixing it afterwards. 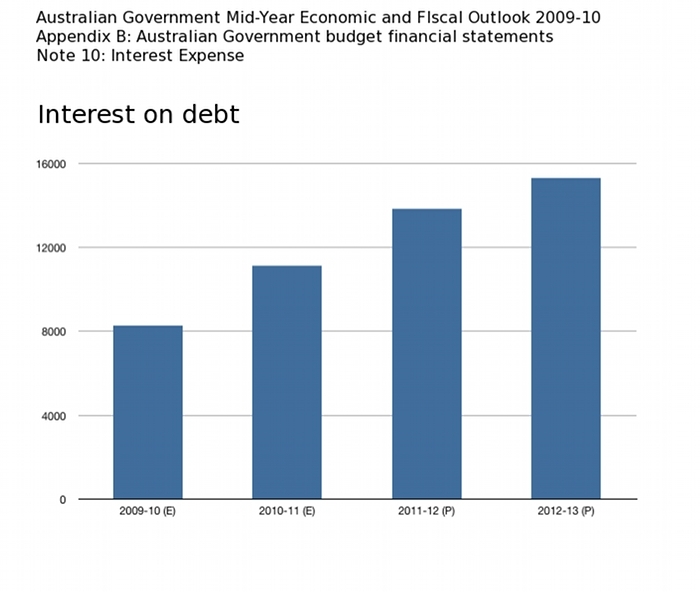 Note: This is only the “Estimates” (2009-10, 2010-11) and “Projections” (2011-12, 2012-13) for Interest-on-debt, as at November 2009 when the MYEFO was published. With the Rudd Government still borrowing well over $1 billion a week, who knows just how big the Interest-only bill is now. One thing we do know. We cannot pay it back. * Total Interest includes $5.49 Billion in ‘Other financing costs’ – What exactly is that, and who gets it?